As an affiliate marketer you will probably be managing several different websites and promoting multiple affiliate products, which can become quite cumbersome to manage. In simple words, you advertise and promote a product or service on your blog or website, with every visitor that you bring to them, and who actively buys the product or service will fetch you a share of the revenue generated or a standard fixed price will be offered. In this post I’ll feature different cool free affiliate marketing widget plugins for WordPress users. These plugins cover a wide variety of functionality, so please browse through the collection and I think you’ll find at least a few that can help you in one way or another. Whether you use one or all of these, they will, in most cases, give your WordPress sites the extra boost that they deserve. Don’t forget to give your most welcomed feedback to improve quality of our blog. Affiliate Marketing is the fastest growing advertising method and it is very cost effective. This plugin facilitates the affiliates recruitment, registration, login, management process. 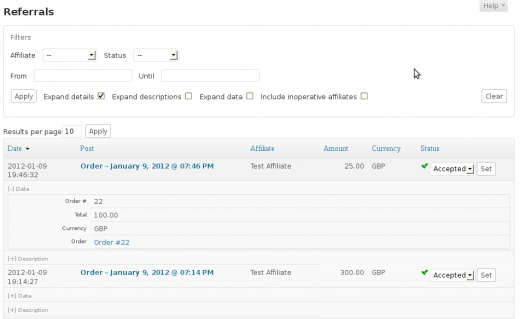 It will also track the referrals your affiliates send to your site and give commissions appropriately. Affiliates Manager integrates with some popular e-commerce solutions. ThirstyAffiliates empowers website owners with the tools they need to monetize their WordPress website with affiliate marketing. It lets you administer your affiliate links, assists you with inserting them into your posts, pages and comments and gives you a central location in WordPress to manage all of your affiliate links. Handy quick add tool lets you easily create new affiliate links without even leaving the post edit screen. Make Money on Your Blog with a Full Shop, Product Inserts, and Direct-to-Merchant Links from Prosperent. Create a shop on your blog filled with products relevant to your site content. Convert any keyword or phrase into an affiliated link to the highest converting, most relevant product. Automatically places products within all posts and pages on your blog. Any link on your site that leads to a product or merchant will automatically convert to an affiliate link. With this integration plugin, referrals are created automatically for your affiliates when sales are made. The plugin allows you to set a referral (commission) rate so that your affiliates get credited with a referral based on a percentage of each sale’s total net amount. Affiliates is an outstanding platform that helps to boost sales through your affiliate program and is the ideal affiliate solution for WooCommerce. 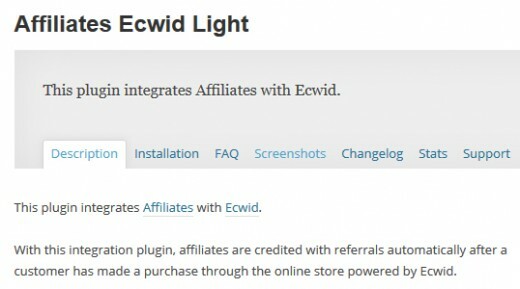 With this integration plugin, affiliates are credited with referrals automatically after a customer has made a purchase through the online store powered by Ecwid. The plugin allows you to set a referral (commission) rate so that your affiliates get credited with a referral based on a percentage of each sale’s total net amount. The Affiliates system provides powerful tools to maintain an Affiliate Marketing Program. It also provides a solid framework for developers, who wish to build customized solutions based on a sound data model. With unlimited affiliate program management tools available on the back end and a set of shortcodes to provide Affiliates information on their performance on the front end, there is everything you need to start an affiliate program. Search, select & import affiliate products into your WordPress website and display those products using the most popular eCommerce platform, WooCommerce. Simply use our powerful search form to find the products you want to promote, then click to import those products directly into your WooCommerce store. WooCommerce is a free eCommerce plugin that helps you sell anything on your WordPress blog, even affiliate products. ProductWidgets is backed by a database containing millions of products from niches such as fashion, technology, music, movies, gaming, sports, and health, and new products are added every day! Products are selected automatically based on keywords you define or the content of your website. Also, each widget’s products are rotated regularly so returning visitors see fresh products every time.